The foregoing poem was written rather quickly and the quality has surprised me, usually I think everything I do is useless, but I like this piece. In fact I like it so much, I feel a story coming on, whether it will be short enough for me to want to post that eventually on this blog, I don’t know, but it is inspiring me to do more and there are other poems creeping into my head of a similar theme too! My reality was shaken badly, I became broken, and will I mend? I am cold and I am hot. For the last 6 months I have attempted to teach myself art, sketching and painting particularly with watercolors. 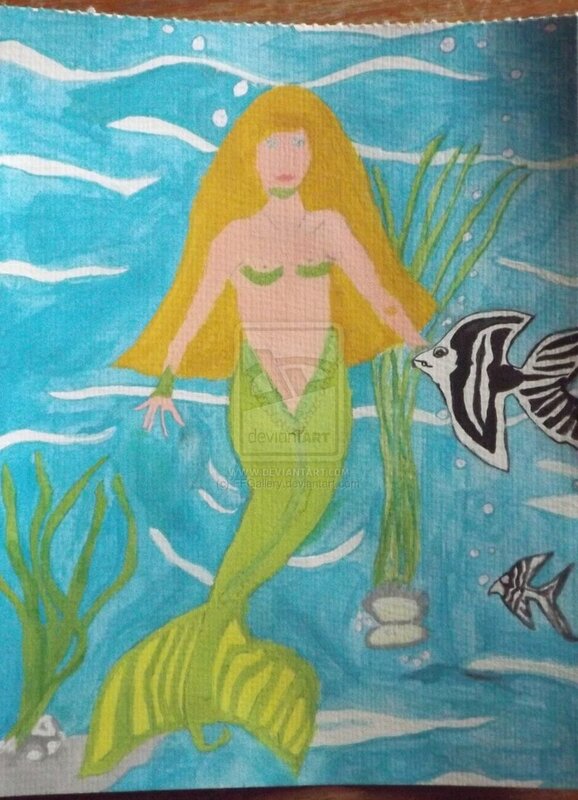 The image that you see is my first ever attempt at creating a watercolor mermaid under the sea scene and my first ever attempt at under-painting a picture. This image is unfinished and I am afraid to say it will stay that way because I mixed the shades of colors that are used on the paper and my fiance Paul knocked over the palette when getting it for me and it was all lost and I am very reluctant to attempt to try making more of the same shades of color as I don’t want to completely ruin this picture. There are some blemishes to the image, for example the mark of yellow on her left inside elbow amongst other things, but I cannot repair these without severely impacting on the color scheme, as I cannot guarantee I can mix the same shades again. I am a self-taught artist that have only really been practicing twice a month any kind of art-work for about a year now, as I mentioned before my attempt at watercolors started about six months ago. In my personal opinion, starting to teach yourself artwork, particularly sketching/drawing shouldn’t really start at how-to-draw books, because that never worked for me, instead, trusting my own eye works better and reading books based on painting; that is of course if you eventually want to move onto painting your images. I have been getting a lot of comments from my immediate family and friends that they believe I have a natural talent for art considering that I spend less than five hours a month practicing; personally I don’t see it, I see too many imperfections in my work and I cheat. For example, I have hidden one of the mermaid’s hands in this picture because I couldn’t make it look as good as her right hand and the paper was thinning with all the erasing I had to do. I have a gallery at deviantart.com if you wish to see more pictures that I’ve done as well as my budding artist four year old son, Henry, some of his best work are up there, which reminds me that I must add his version of a toucan up later on.